JingleBling!...a Holiday Jewelry Shopping Party...First Friday, December 7th, 5:30 to 8pm in the Kortman Gallery benefitting the Rockford Art Museum! 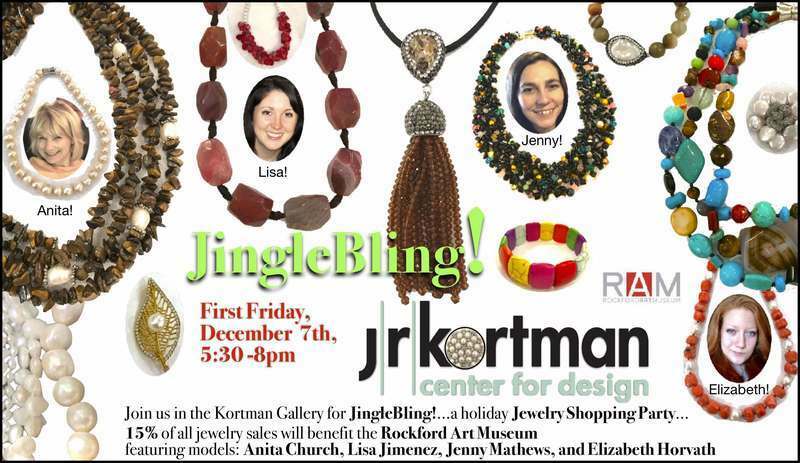 J.R. Kortman invites you to JingleBling!…a holiday Jewelry Shopping Party, upstairs in the Kortman Gallery on First Friday, December 7th, from 5:30 to 8pm. 15% of the proceeds from jewelry sold during the event will benefit the Rockford Art Museum. See the latest designs, many one of a kind pieces that just arrived exclusively for J.R. Kortman from the Pearl markets of Shanghai and Beijing and other exotic locations. Our jewelry fashion consultants (Anita Church, Lisa Jimenez, Jenny Mathews, & Elizabeth Horvath) will be on hand to show and model our exciting, elegant, and festive necklaces, bracelets and earrings that will be great for you to show off this holiday season. And guys, for your holiday gift buying, this is an excellent opportunity to see cool jewelry with the help of our models who can assist you in selecting just the right piece. And best of all, the Kortman Gallery Bar will be open with bartender Dennis Horton serving up some holiday cheer! This is the way to shop!!! P.S. At the same time you can see “Greetings from Rockford, IL USA” a holiday group exhibition now on display in the Kortman Gallery featuring postcard art created by 22 of some Rockford’s most accomplished artists. J.R. Kortman Center for Design is located at 107 North Main Street in downtown Rockford. For more information call 815-968-0123.